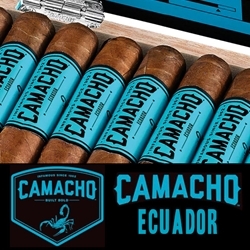 Aromatic and elegant are two words that describe Camacho Ecuador as being a great hand-rolled premium cigar. Constructed with Dominican Pelo de Oro ligero fillers, earthy Brazilian Mata Fina binders and bound together with a one of the most versatile wrapper leaves, the Ecuador Habano. Lighting up this handmade premium cigar releases bold aromas of peppery smoke, hints of floral and citrus, making this a well-rounded medium to full bodied smoke. Get your humidor ready and fill it up with Camacho Ecuador premium cigars, then sit back and enjoy! Check out all the styles available here today for a discount price! Call us for more details!